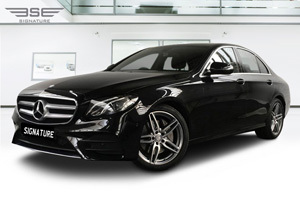 Signature Car Hire has always had a reputation for providing quality Mercedes cars for clients looking to rent a pristine executive saloon in London for business or pleasure. The addition of the new shape E-Class is no exception and offers drivers and passengers a spacious, comfortable and refined self-drive hire experience. A great choice for business travellers coming to the UK, corporate car hirers or even a bride looking for a wedding car for hire, this model can be rented on a self-drive hire basis or with our highly skilled and professional chauffeurs. This new model comes in a sleek and glossy black colour with sumptuous and professional black interior. The new re-vamp from Mercedes is plush and has an expensive feel much aligned and taking inspiration from their popular S-Class model. This is an automatic diesel model and has 3 rear passenger seats. As you would expect, when you hire a Signature saloon with the Mercedes badge, you will get a refined car which comes with high quality finishes and functions throughout. All this comes with S-Class-inspired technology which makes this rental car safer and easier to drive for your UK self-drive hire experience. Offering cruising ability and composure throughout the Mercedes E Class is faster and more efficient than previous models, making it ideal for business users looking to rent an executive car in London. In short it is a well-equipped, efficient and stylish executive rental saloon. If you like a car with gadgets, then with this E-Class rental car you can enjoy DAB radio, Bluetooth, a USB socket and an 8.4in colour screen. You can also control everything using a rotary dial positioned between the front seats or simply by speaking. 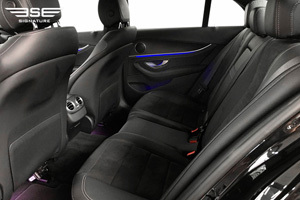 For long distance travellers this car is comfortable and spacious. Plenty of legroom and bags of space in the boot for suitcases or even gold clubs! To rent this Mercedes E-Class from either our Northolt London branch or our Heathrow branch, simply get a quick quite online or call us on 0207 118 2244.